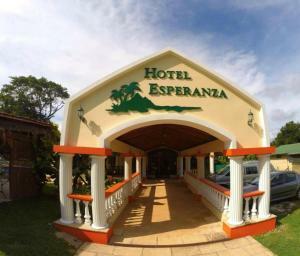 ﻿ Best Price on Hotel Leyenda in Puerto Carrillo + Reviews! Offering an outdoor pool and a restaurant, Hotel Leyenda is located in the tropical town of Carrillo. It is just 1.2 mi from the beach and features free Wi-Fi and continental breakfast. Rooms here will provide you with a TV, air conditioning and a mini-bar. The private bathrooms come with a shower, and while most rooms have pool or garden views. The hotel has a tour desk and offers a loan service of umbrellas and tables to use on the beach. Guests enjoy traditional cuisine at the on-site restaurant, and other options can be found in the town center, just 1.2 mi away. The property can lend umbrella and, tables for use at the beach. Camaronal River is 1.9 mi from Hotel Leyenda, while Nicoya, a colonial town, is 25 mi away. Carrillo Airport can be reached in a 15-minuite drive. Please note, if arriving by car the best route is Carretera Nicoya /Samara. Guests are required to show a photo ID and credit card upon check-in. Please note that all Special Requests are subject to availability and additional charges may apply.